Every time I hear or think of Ginkgo biloba I want to start singing "Baby Beluga." I swear my brain thinks it sounds exactly the same. Just me? Today, ladies and ladies, I want to talk about a little problem I've been having recently. I would also like to put it out there that I have not ever popped out a kid, nor is my eggo preggo. So please keep that in mind. I can't seem to hold on to a thought. Seriously. The thought will form, last about 2.5 seconds, and then it's gone, never to come back again (now my brain has moved into singing Jesse McCartney. C'mon guys, keep up.). I will have some great idea and I'll start to act on it, and then be all, "Wait. What was I doing?" For example, I'll think about looking something up online. I'll pull up Google and immediately forget what I was going to look up. AND THEN I NEVER REMEMBER. This is not mommy-brain. I can only imagine how bad my mommy-brain will be when that time comes. Dear Lord. Speaking of the Lord, we have a new pope! That's all. That's probably the only speak of religion you will see on this here bloggity blog. 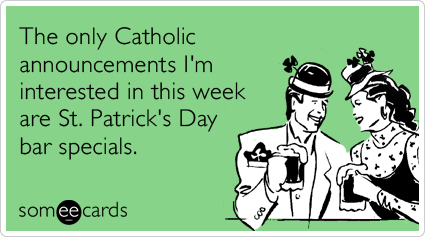 It's cool, guys -- I'm Catholic. ﻿Maybe I can't hold on to a thought for very long because my brain moves too fast. That doesn't make any sense. Please forgive me these ramblings. I'm flippin' tired. Oh, and hey. I have an audition for a play tonight, so tell me to break a leg. Thanks y'all. I'm completely ADD. I forget everything, and what I'm saying in mid-sentence. A lot. I may be late, but break a leg.